Some people use the term “bumblebee” and “honeybee” interchangeably, but make no mistake – they are not the same! Honeybees and bumblebees are easily the most plentiful type of insects in the country, so you have probably seen lots of both honey and bumble bees in your lifetime, but do you know how truly different they are? Yes, they both buzz and fly around the flowers in your backyard, but the species are actually quite different. Honeybees, according to Myrmecos, are slender, and only a little bit hairy. You might almost even confuse a honeybee with a wasp, because the tips of their abdomens are pointed like wasps. They have lots of stripes on their bodies, with small grey stripes at the tip of their bellies. They’re usually all the same size, except for the queen, who is much larger. Bumblebees, by contrast, are large, broad bees, with rounded abdomens and lots of black hair. The color of bumblebees varies greatly depending on the species, but the most common species have blocks of colors – not necessarily in stripes – on their abdomens. They also are very changeable in size, with some growing quite large even if they aren’t the queen. Their living arrangements are different, too. Bumblebees tend to live in hives with small numbers of bees – 50 to 400 on average. Honeybees are much more clustered, and may build hives with as many as 50,000 bees, according to Bumblebee Conservation Trust. Last, as you might have guessed from their names, bumblebees do produce honey, but only a little bit when compared to honeybees. They are much more well known for their buzz (the bumble). Honeybees produce lots of honey, which is often harvested and sold to create a variety of delicious and nutritious products. Now that you know which type of bee is producing our delicious, natural honey, head on over to our Process page to learn more about the honey-making business. 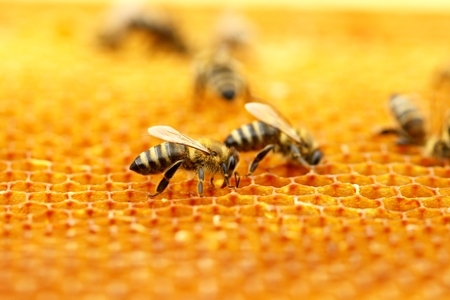 To learn more about our natural, quality honey and how we can supply your business, call us today at 281-576-1700.